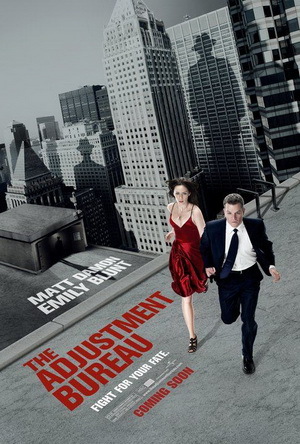 "The Adjustment Bureau" stars Matt Damon and Emily Blunt, as two people that keep running into each other, but a sinister "bureau" tries to keep them apart. Damon plays David Norris, a congressman aspiring to become the President of the United States. Blunt plays Elise Sellas, a dancer David is attracted to, but can't seem to go out with. This film was strange and very derivative. It is as though the writers attempted to cull themes from different sources that are not related, in trying to make a film that comes off quite confusing. This is the kind of film that only makes sense to crazy people in Hollywood.